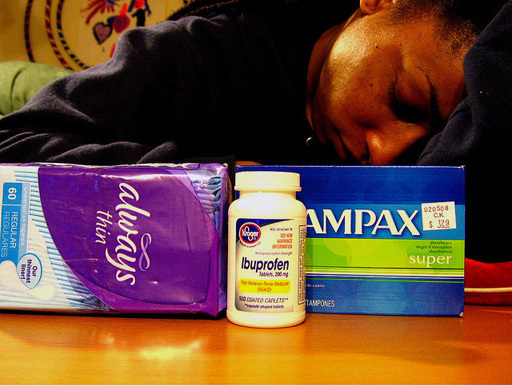 Woman suffering through a bad menstrual period (bandita/Flickr). I could hear the fear and panic in my friend’s voice over the phone. She was bleeding so heavily that she was debating whether to go to the emergency room, but she wanted my opinion. Was she over-reacting? Was this just a normal part of approaching menopause? Since menopause is associated with women no longer getting their menstrual period, women transitioning into menopause are often frightened by unpredictable, prolonged or heavy bleeding. The results of a new research study may help alleviate their fears. Menopause is when a woman stops producing reproductive hormones like estrogen, causing her ovaries to stop producing an egg each month. This occurs on average when a woman is 51 years old, but some women experience menopause in their 30s or 40s. How periods change during perimenopause was the focus of a new research study, recently published in BJOG: An International Journal of Obstetrics and Gynaeocology. A collaboration of researchers from several medical institutions performed a long-term study on the bleeding patterns of perimenopausal women to determine what women normally experience. The researchers used data from the Study of Women’s Health Across the Nation (SWAN), a multi-site longitudinal study of midlife women living in the US. They analyzed the data from the SWAN menstrual calendar substudy conducted from 1996 through 2006 at three locations – northern California, Los Angeles and southeastern Michigan. The research collaboration included investigators from all three regions: University of California Davis, University of California Los Angeles, University of Michigan School of Public Health and University of Massachusetts Medical School. The participating women completed daily menstrual calendars and provided information monthly on hormone therapy, gynecological procedures, smoking and physical activity. Women taking hormone therapy or hormone birth control were excluded, since these affect ovarian function. This was the first long-term study to include a large population of 1320 midlife women (aged 42-52) of multiple races: African-American, Japanese, Chinese and white. Previous studies were short and mostly limited to white women. The researchers found that it’s common for women during perimenopause to experience prolonged bleeding for 10 or more days, spotting for six of more days and/or heavy bleeding for three or more days. Over 90% of the women experienced between one and three episodes of bleeding that lasted at least 10 days in the past three years, and 28% experienced three episodes within a 6-month period. Similarly, 67% of the women experienced at least three occurrences of spotting for 6 or more days with 24% recording three episodes within a 6-month period. And 35% of women had at least three episodes of heavy bleeding that lasted three or more days, where heavy bleeding was defined as having to change a sanitary product every one to two hours for more than four hours per day. Very few differences were seen between races. African-American women were less likely to bleed for 10 or more days or to spot for six or more days, compared to white women. And Japanese women were less likely to have three or more days of heavy bleeding, compared to white women. The researchers hope that their study will help guide both clinicians and patients, by defining “normal” bleeding patterns for women during midlife. Hopefully this will help concerned women like my friend, by educating them on what to expect.